If you’re proud of your home, of course you’ll want to make sure it’s sparkling clean and welcoming at all times. No doubt your curtains and upholstery is cleaned on a regular basis, and you call out a professional carpet cleaner twice a year to keep your carpets spotless. But what about other fabrics in your home? Take lampshades, for instance. Fabric shades on table or standard lamps collect dirt and dust over time. In order to restore their freshness and appearance, they should be cleaned periodically. This can be a difficult job with delicate fabrics, particularly if the shade has additional trims or ornaments or is glued (rather than stitched) onto the frame. Unplug the lamp and remove the lampshade if you can, so it’s easier to handle. With a small paint brush, remove the dust starting from the top and working all the way down in long sweeping motions. Work on one section at a time, then turn the shade and repeat. For large shades and thicker fabrics, you can use the brush attachment of your vacuum cleaner. Use a hairdryer on a cold setting for lampshade trims and fringes to remove any dust. To wash a soft fabric lampshade that’s been stitched onto the frame in the traditional way, fill a large bowl (or use the bathtub!) with cool soapy water and place the lampshade inside on its side. Lather up and turn the shade until all the fabric is covered, then drain the water and refill with clean water for rinsing until all the soapy residue has disappeared. Shake the lampshade to remove excess water, then stand/hang to air dry or use a hairdryer to speed up the drying process. 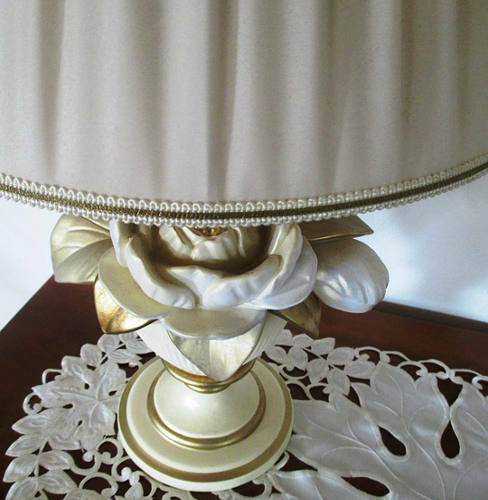 Washing a glued fabric lampshade needs to be done with extra care so that the glue doesn’t dissolve. Mix a cool soapy solution in a bowl and whisk until very frothy and the suds virtually dry. Using a clean, dry cloth, apply the suds to the outside of the shade, working in sections. Be particularly careful on any areas that are glued together – don’t rub too hard and make sure they don’t get overly wet. Plastic interiors should be wiped with a damp, soft cloth dipped into a mild soapy solution. Finally, using a fresh, clean, damp sponge, rinse the suds from the surface and wipe dry.